A pretty interesting application of algae, Algae-Powered Skyscraper! The ‘Rescuer Skyscraper’ was a finalist for the 2011 Skyscraper Competition. It’s an algae hydrogen-powered floating skyscraper for disaster zones, which could also be used during the rehabilitation and reconstruction of the affected areas. The idea is to produce biofuels through an ingenious algae farm that covers the top part of the structure. The algae will absorb CO2 and produce hydrogen to be used in the bioreactors. The ‘City Respiration Skyscraper’ is designed by the Czech architects Pavlína Doležalová and Jan Smékal. 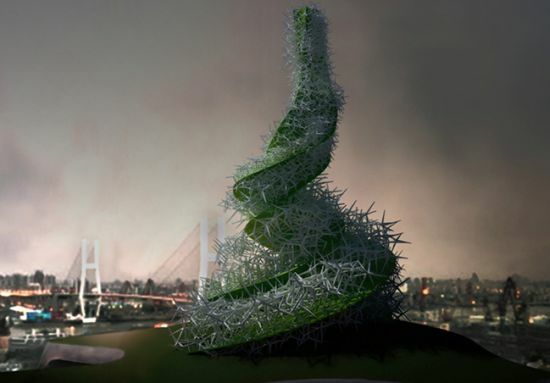 It’s a helicoidal 240 meter-high structure designed to clean the air of the most polluted cities worldwide. The primary structure is a concrete ribbon covered by air-cleaning algae. The outer structure is a three-dimensional cluster of individual three-spike units inspired by sea sponges. The building acts as a chimney, warm and polluted air is captured at the bottom and filtered and oxygenated by algae and water in a specialized water-spray system. Check out eVolo for more posts focused on technological advances, sustainability, and innovative design for the 21st Century.